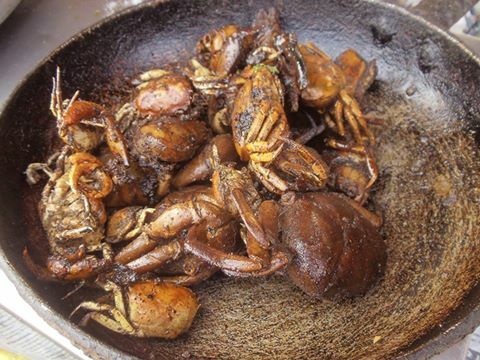 Crabs can be found crawling in paddy fields during the June-September period. They are also found in ponds, rivers and canals. While the crab is filled with protein, you will need to take care while eating it. Firstly, look whether the crab is from a clean water source or not. And if you want to catch the crab on your own, make sure that you grab the pincers first. Otherwise, the crab can bite you and you might end up hurting your fingers and hand. Secondly, clean the crab and nail it so that it doesn't bite. For that break one if its limbs and use it as a nail to lock the pincer. Once you put it like a peg, the crab won't be able to move its pincer. Do the same with the second pincer. Now, the crab is at your mercy. Open its abdomen and look for any parasites. If you find any, then remove them and clean it. It's better to rip off the abdomen. Thirdly, break all the limbs. If you want to munch the legs, keep it aside and wash them properly. Then break the pincers and wash them properly. Now you can remove the locking pegs. The pincers are juicy and tasty, so put it aside to roast them separately. Thirdly, prepare a fire to roast the crab. If possible fetch goitha (dung cake). A crab gets roasted uniformly on a burning goitha. If it is not available, go for coals or logs. Put the crab and pincers in the embers. In case of burning goitha, put the crab and pincers on it and cover them with another piece of goitha. Keep on checking so that they don't get burnt. After few minutes of roasting, take them out from the fire and wash off the burnt parts and charcoals. Remove the crust off the crab and set aside the roasted flesh. Add minced onions, chillies, turmeric powder, salt to taste and mustard oil, and mix well. Now your dish is ready to be eaten with puffed rice, beaten rice or chapatis. The Tharus call it kankhod ke chutney and make sure they have it during the paddy season. You can munch the roasted pincer without further processing. It's juicy and delicious. Pancakes are a common dish among communities throughout Nepal. However, the Tharus have their own unique pancakes – they call it chita roti. To prepare it you will need wheat flour, mustard oil and salt or sugar to your taste. The preparing process is very simple. Mix water to the flour and make a watery mixture. According to your taste, add either salt or sugar to the mixture. If you are adding salt, then make sure to add a pinch of turmeric powder to it. Now spread mustard oil on a frying pan. You can also use a cauldron. Once the oil is hot, pour the mixture on the pan slowly and make the shape of a roti. With the help of spatula, spread the flour mixture. After few minutes, turn over the roti and let the other side also cook well. Now you can serve the roti with chutney or curry. It's not mandatory to use mustard oil. You can try using clarified butter as well. Taro is generally considered a second grade vegetable. However, if you cook it well and your cookery is innovative, you can prepare a mouth-watering dish out of it. The Tharus in the eastern Nepal love eating taro leaves (kachu) and they have their own method of cooking it. They call it airkanchan. If you haven't eaten it, try next time you are in the Terai or cook it in your own kitchen following the below steps. Pick broad taro leaves and wash them. Put it on sun for half an hour, so that the leaves become softer. Prepare a paste of rice flour adding turmeric powder and salt to taste. Spread the leaves on the back of a Nanglo (sifter) or any other flat surface. Now apply a thin layer of the turmeric powder and rice flour paste to it. Put another layer of taro leaves and again apply the paste. Spread another layer of leaves on it and apply the paste. You can go for two or three layers. Now fold the spread of leaves into a tubular shape. While folding, apply the paste to keep the leaves intact, so that you get the desired shape. Now cut it into pieces – you will get round shaped leaf cakes. Spread mustard oil or clarified butter on a cauldron and fry the leaf cakes, turning over and frying both sides. Once your leaf cakes are fried, prepare a mixture of curd and water. Fry the sliced onions, chillies and spices along with turmeric powder in mustard oil and pour the curd-water mixture. Cook it for a while and once it starts boiling, add the fried leaf cakes. Leave the cakes to be cooked well, but make sure that the leaves don't peel off. Now your dish is ready and you can serve it with rice and other curries.